The Buddha and the Budget — Continued! Something amazing is happening in Wisconsin. If you’ve been following the news, you’ll know that for the past two weeks, tens of thousands of protesters have been gathering in and around the Statehouse in Madison, expressing to Gov. Walker their passionate support for public employee unions and the right to collective bargaining. From everything I can see, it’s been a nonviolent movement — which I believe is what lends it power and credibility. And over the last few days, I’ve gotten some indication that at least some of the folks there are using mindfulness practice to ground their actions. This morning, Sharon Salzberg tweeted this photo from the New York Times, and the photo above is one that I pulled off of Flickr (it was taken on February 22). We are truly at ground zero in this struggle for union rights and fairness in balancing the budget. Susan and I just returned from the state capitol where we walked, chanted, laughed, and braved the snowfall with about 200,000 of our closest friends! It is really inspiring to see so many people from every walk of life, and every age from babies to elders so unified in their intention. There is definitely a war going on here, created by the union-bashing tactics of our newly elected Republican governor. And at a deeper level there is a great feeling of unanimity, nonviolence, goodwill, and hope that is truly inspiring. I believe we take one step backwards for every two steps forward. Both are in clear evidence in Wisconsin, and in many other capital cities across America today. As an antiwar and civil rights activist in the 60’s I organized and attended many rallies and marches. We were young, and mainly without elders for guidance, so we often acted unskillfully. Today it is very different. Young activists have elders for guidance and stability. The protesters enjoy a broad range of support. We are nonviolent, committed, and having a good time, even with the stakes so high. And our actions are informed by ethical principles and spiritual practices which act as beacons as we move into the confusion and darkness of backlash and regression. This struggle will be a long and difficult one. Thank you again for your support. People often question what is “Buddhist” about socially engaged Buddhism. I think this is a wonderful case study in what it looks like. In a way, it’s almost irrelevant what political position, if any, these people hold on the budget issue and on unions. 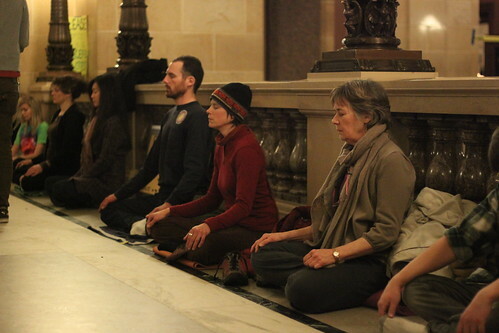 I’d like to think that their peaceful presence at the Wisconsin capitol is contributing to some kind of sanity in the atmosphere there, in what could easily become a volatile situation. I am grateful that they are holding a space of nonviolence and equanimity in the midst of everything. I’ve been following this (Wisconsin protests) closely and with much hope and joy. The American people actually are willing to act. I had not heard of the meditation aspect, and was happy to see the photos and hear the news. Now in Minnesota, I think of joining them. Thanks for this. 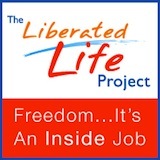 It’s inspiring to know that Buddhist practice and activism are not mutually exclusive!